Alin is a software developer, trainer and facilitator at Mozaic Works in Bucharest, Romania. He is organizing Coding Dojo meetings, coderetreats and open space discussions within the Bucharest Agile Software Meetup Group. 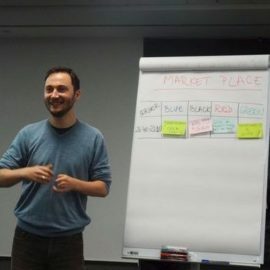 He previously spoke at several technical meetups (such as Bucharest Java User Group, Bucharest Agile Software Meetup Group, Softbinator) and at international conferences (such as I T.A.K.E. Unconference, and SoCraTes Germany). He is also part of the team of global coordinators of the Global Day of Coderetreat.